Sales of Flipkart and Amazon are ready for closure next week, ecommerce is coming out in the discount for the festive season. Both Flipkart and Amazon are busy promoting upcoming sales of both online and offline. These sales promise great deals on various products. It is no wonder that many consumers are waiting for the festival season to sell Amazon and Flipkart to hold great deals on electronics, large appliances and other favorite products. 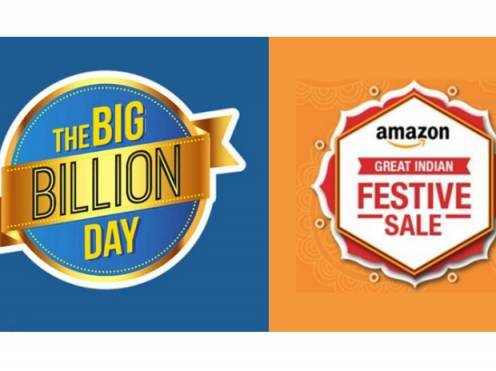 After all these years, we have some idea about what to expect from Flipkart's Big Billion Days Sale and Amazon's Great Indian Festival Sale this year. Limited-time sales are so great that it does a lot of work to track good deals and find the products you want to buy. But if you prepare yourself well, then you can save money and buy your favorite gadget without worrying anything. We have created a simple guide to help you prepare for the upcoming Festive season sales of Flipkart and Amazon. First of all, planning ahead is always better. You should first do your homework so that you do not waste precious time during the sale. Do your research and make a list of products that you want to buy during the sale. This will help you decide what you want and what online marketplace you need during the sale. In the days to reach sales, both Flipkart and Amazon will reveal some of their biggest deals, or at least tease. Keeping an eye out for these can help you make a purchase decision before the sale. Once you've got your list ready, add those products to your wish list on Flipkart or Amazon. By joining a loyalty program like Flipkart Plus or Amazon Prime, you can help you enjoy many free benefits. Flipkart's Big Billion Days will open at 9 a.m. on 9th October, especially for members of Flipkart Plus, while Amazon's Great Indian Festive Sale will leave for Amazon Prime Subscribers from 12 o'clock on October 9. An initial access to the sale ensures that you have a better chance of catching some great deals. That's not everything. These programs also come with many other benefits that can be useful if you make many of your shopping online. While Flipkart Plus is free to join, Amazon Prime costs Rs. 999 per month. Although telecommunication operators provide free membership for customers to choose from. Keep your personal information as your shipping address and the payment information saved in your accounts for quick checkout process. This makes it easy and fast to get deals and offers in flash sales. You can also consider saving your payment information in your account to keep the checkout process easy. If you want to take things at the next level, add the remaining amount to your Amazon Pay or Phonepea Welt so that you do not worry about OTP (one time password) while paying in the sales of Amazon and Flipkart, respectively. If you add money to your wallet before the sale, then online marketplace usually provides cashback. Keep in mind that some online marketplace disables cache-on-delivery methods during the festive season sales to prevent misuse. Make sure that you make your plan accordingly. Both Flipkart and Amazon are offering a wide range of payment options this year. Choose the person who helps you save money and makes things comfortable for you. With no cost-effective EMI options for instant credit up to 60,000, online marketplace does not want to leave any stone to save you from purchasing high-priced goods online. Flipkart has signed a deal with MasterCard and HDFC Bank to give a discount on cardcard transactions, while the hands have got with the Amazon State Bank of India. In addition to the specific card, Flipkart and Amazon will both offer cashback to PhonePay and Amazon Pay users respectively. While using desktop websites is easy to use during the festive season, you still need to install the mobile app for Flipkart and Amazon on your smartphone. Since next week's festive season closes at the end of a week, you can get busy with other things or you can not access e-commerce websites at work. Make sure you are signed in to your account and your wishlist is ready. This will make it easy to access your curious products on purchasing. It is easy to take this kind of festive season during the sale. Once you make a list and you will be with it, it will be easy to stay in your expense cap. Decide what you want for yourself or your friends and family and only buy when you make a great deal. Impulse purchase will come to your spending budget. I hope you must have liked this article very much, please do comment and tell us how much you have liked it.